I wonder if it's possible to get an identification on an aquatic microscopic organism based on a description? I realise my chances are slim. Unfortunately I did not have all the equipment assembled to do photography through the microscope at the time. And I didn't think to do a drawing of the creature while it was still visible under the scope. The organism was viewed in a sample of fresh water taken from a creek that was drying out on Kangaroo Island in South Australia. There was very little water left in this creek and it looked stagnant / poor quality. The shape of the organism resembled a slug but was somewhat fatter. So basically like a fat slug. It was green and had a textured surface. There was also another organism inside it which was tiny and red. I could see the little red organism moving inside it. I don't suppose this sounds familiar to anyone? I also saw another organism from the same sample of water that I haven't been able to identify. And it would be impossible to give a description of this creature as it had a lot more intricate detail compared to the slug-like organism. It was truly bizarre looking. It was black and white and was swimming around in circles. Eventually, it calmed down and allowed me to view it with the 40x objective. Really weird looking. I really regret not being able to photograph either of these organisms. I hope I can come across them again one day but the creek has completely dried out. How about an Ostracod for the sluglike one ? Interesting looking creature but that is not what I saw. 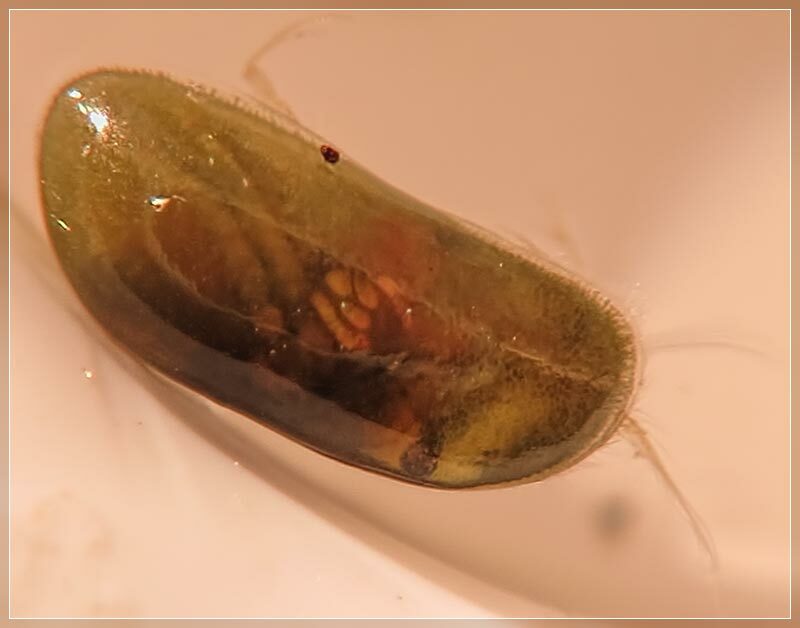 It looks like the Ostracod has a semi hard shell though the creature I saw looked soft from it's appearance. It was more curvey as well. And it did not have any appendages or antennae. Also had a deeper green colour. Ive just come across two videos of Euglena and this is likely what I saw. The first video shows them as very skinny though the one that I saw appeared quite fat. The second video demonstrates that they can change shape at will and I can certainly see their 'fat slug' form before they go completely ball-shaped. What I thought was a red organism inside it must have been their 'sensor.' Though I could clearly see it moving. Euglena does have a red eye spot for detecting light. They have chloroplasts, so they use their 'eye' to move toward light.